A cat litter tray is an essential tool for most pet owners. Most self-cleaning litter boxes for cats are the best solution for you and your cats. How many litter boxes should you have per cat? What should be the features and functions too look for when buy cat litter trays? Omega Paw Roll’N clean handles the mess in an elegant way. It has a patented grill which separates the clean litter from waste. Just roll the box onto its top and then spin it back to the upright spot for disposal of waste. The only con it has is that it needs the larger floor space relatively. It is one of the top rated litter trays of 2018. A perfect match for multi-cat households and is one of the largest litter box in the market. One of the finest option for messy cats. It’s an all rounder which allows easy access to your cats. It has a wide top opening and allows your cat to turn around inside it. A non-slip lid attached at the top keeps the litter inside it. Lid has a special grating which helps the litter to fall back into the pan. It is one of the finest addition in 2018 which ensures privacy with hooded top. It’s sleek design helps to catch the litter from your cat’s paws. The charcoal filter minimize the smell. The unique design minimizes overflow and tracking. Your cat will love to poop in this masterpiece! The IRIS open top litter box comes in a stylish design and three sided extra tall walls. It will keep the spray and litter inside the box. 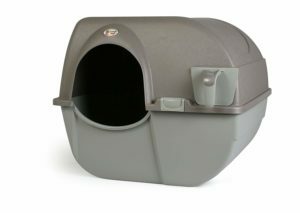 Molded-in-feet and recessed bottom provides enough space for litter pan to fit neatly. We love our cats and want them to live harmoniously. Therefore, as cat owners we should find quality litter trays or litter boxes for their home, especially for indoor cats. However, it’s also true that we hate dealing with our litter boxes, most of them are not user-friendly. It means your choice is either the box with the scoop or some expensive contraption. With the best litter tray for cats, you’ll find the product features very handy.